The National Sheep Association has announced Vickers & Barrass with Darlington Farmers Auction Mart as major event sponsors of North Sheep 2017. The National Sheep Association has announced that the major sponsors for one of the sheep industry’s most important events, NSA North Sheep, will be Tow Law based rural chartered surveyors Vickers & Barrass in conjunction with Darlington Farmers Auction Mart. Returning to County Durham, NSA North Sheep 2017 will take place on Wednesday 7 June at West Shields Farm near Tow Law, courtesy of W.H Smith & Sons a family run partnership managed by John Smith alongside his two sons David and Alan and his nephew Jim. Adam Barras, John Smith, Andrew Armstrong. 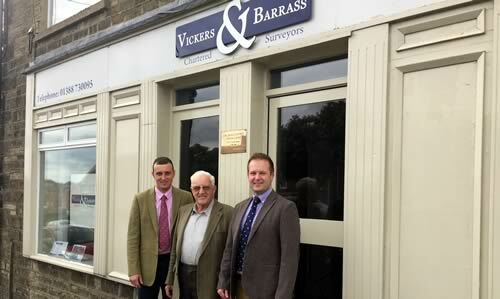 Vickers & Barrass (formerly T H Vickers & Sons) are firmly cemented in the local rural and agricultural community and have been operating as auctioneers and valuers for over 65 years. Darlington Farmers Auction Mart is a long established Auction centre based in the heart of County Durham within the town boundary of Darlington. DFAM is a main centre for sales of prime cattle and sheep in the north east of England. The company also handles large numbers of store and breeding stock at weekly and seasonal sales throughout the year. Vickers and Barrass offer a wide range of services from sales of farm property and farming stock, farm management, valuations, dispute resolution, compensation and compulsory purchase claims and Basic Payment Scheme claims together with Environmental Stewardship matters. With clients stretching from the Scottish Borders to North Yorkshire, Adam Barrass practice manager at Vickers & Barrass Chartered Surveyors and Andrew Armstrong director and senior auctioneer of DFAM explain why they were so keen to be a part of next year’s NSA North Sheep. NSA North Sheep is a key biennial showcase for the UK sheep industry and has a reputation for bringing together industry innovators. The thousands of visitors expected to flock to West Shields Farm will see first-hand how a progressive County Durham farming family operates their 900 acre traditional mixed farm with a commercial sheep flock of 1,350 Mules. They will also be able to attend talks by industry professionals and businesses aimed at giving farmers the chance to bring themselves up to date with the latest developments in sheep farming. As an organisation the National Sheep Association represents the views and interests of sheep producers throughout the UK, receiving tremendous support from everyone connected with the industry. The NSA is funded by the memberships of its sheep farmers. Together with the many industry related activities it is involved with, it aims to ensure that it plays a key part in every aspect of the sheep farming sector. Boost Flock Productivity with Project L.A.M.B.